HMD Global, the home of Nokia phones, has announced the availability of Nokia 6.1 Plus and Nokia 5.1 Plus to fans in new markets. These smartphones bring popular all-screen designs, high-end performance and smart AI imaging features to impressive price points. Thanks to its impressive all-screen design, the Nokia 6.1 Plus gives you a bigger screen experience in a slim and compact package. Its 5.8-inch full HD+ 19:9 screen ratio with 96% colour gamut allows for a vivid viewing experience, making the Nokia 6.1 Plus a perfect smartphone for enjoying immersive content experiences. Beautifully crafted to the exacting standards expected from a Nokia phone, it is encased in glass on the front and back, taking up approximately 93% of the phone’s luxuriously curved surface for the ultimate feel in your hand. Behind the elegant looks, the latest Qualcomm Snapdragon 636 Mobile Platform is 40% faster than the previous iteration of the chipset, delivering first-class graphics and battery efficiency enhancements to ensure you can enjoy your audio and video for even longer. Nokia 6.1 Plus will be available from August 30 in India at a price of INR 15,999. From August 21, fans can use the notify-me on Flipkart or pre-book on Nokia.com/phones. 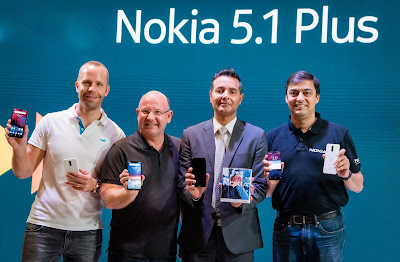 Nokia 5.1 Plus will be available in September in India and price will be announced closer to sales start date.